The Hot Plate Has Moved! Connect with ICC there as we connect with the world! Get a taste of our programs by hearing what top chefs, accomplished alumni and the celebrated chefs that are our deans have to say; inform your career with our blogs and webinars; access our sought-after books and selected recipes; or discover our history, awards and current happenings through our recent press coverage. We invite you to tap in for inspiration and information at any stage in your culinary journey! Wondering how to approach a potential employer? Curious about changing your career path? 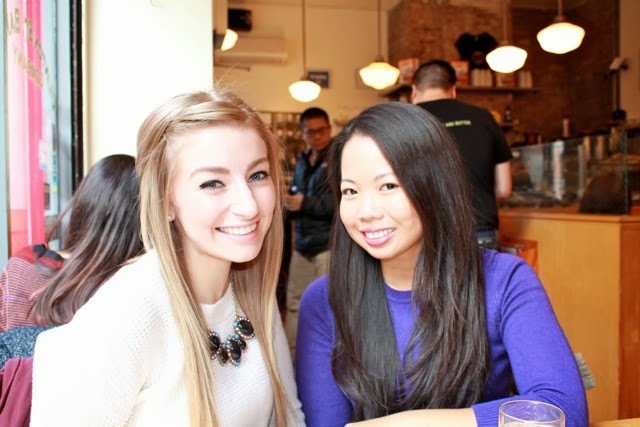 Want to become a better networker? The International Culinary Center's webinar series continues with guidance from Assistant Director of Career Services, Robin Hom. In this exclusive webinar, Robin Hom, Assistant Director of Career Services at the International Culinary Center, provides guidance and answers questions about goal setting, resume writing, interviewing, and much more. When you come to the International Culinary Center, you’re not coming to cooking school. You’re coming here to learn to be a 21st-century chef. Learn more about why you should choose the ICC or schedule a tour to experience “a day in the life” of our students! Being an avid baker before coming to the International Culinary Center, I used to pride myself on my ability to master most recipes I tried. If they didn’t turn out the first time, I was usually able to figure out where I made mistakes and correct them next time. However, French macarons were an exception to this. Every time I made them I seemed to have some kind of problem. Either they would spread too much or crack...I was never able to achieve the classic “pied,” or feet (sometimes called a ruffle), around the bottom of the cookie. 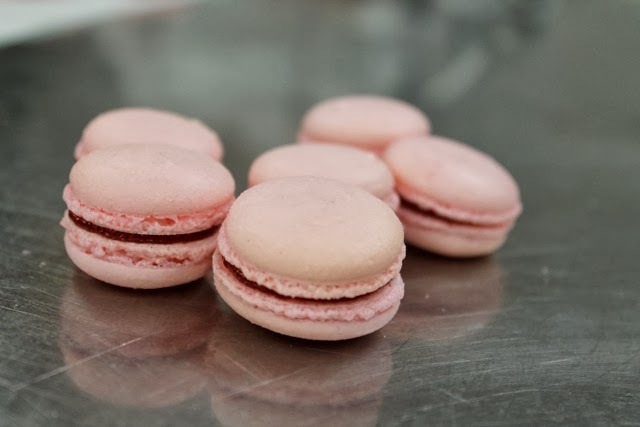 I always knew that French macarons were a difficult recipe to master for the amateur baker, but it always frustrated me that I couldn't get them right. Not to mention the fact that they are one of my absolute favorite desserts and I was dying to be able to make them myself. 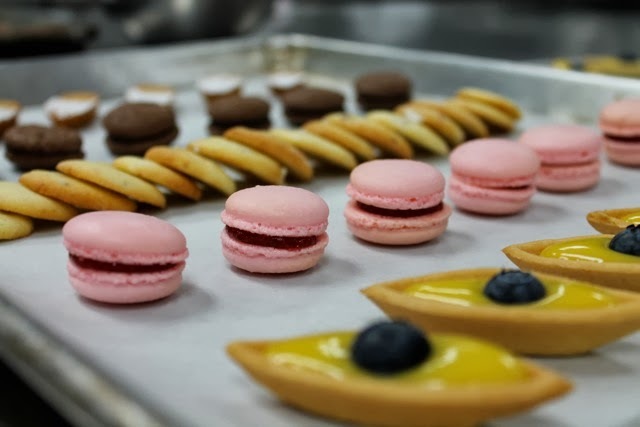 As a result, I could not wait to learn from the pros here at the International Culinary Center on how to make the perfect French macaron. When the day finally came during our petit four unit, I could not be more excited. We made three different kinds of macarons: gerbet, traditional and almond paste based. The gerbet style is the kind that you typically see in bakeries these days. 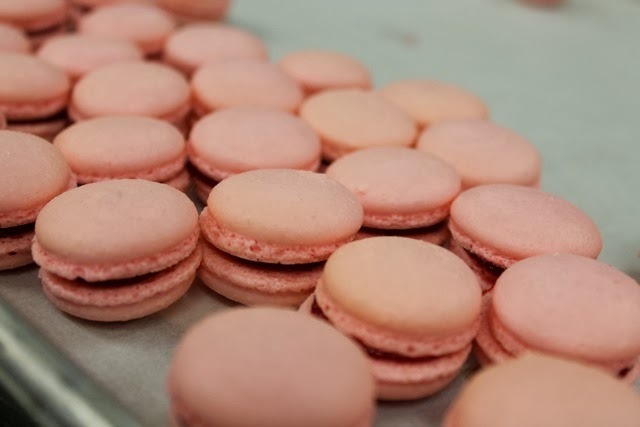 I made sure to perform every step very carefully in the hopes of creating the perfect macaron. I waited anxiously for them to come out of the oven, waiting to see the perfect ruffle at the bottom. I knew if this were there, I would have done it. When they were finished baking, I was absolutely thrilled! Perfectly smooth macarons that were crisp on the outside and slightly chewy on the inside. I was so proud of myself for overcoming this recipe that I had struggled with so much in the past. It was with the helpful direction of my chefs that I was able to do so. While it is always enjoyable to make things you know you are always (or almost always) successful with, there is something so satisfying about overcoming something that has been difficult for you. It is so important to challenge yourself and try new things to grow as both a person and a chef. As part of my Professional Culinary Arts plus Farm-to-Table program, my class is given the opportunity to go on field trips to get a better sense of individuals and companies who are passionate about farm-to-table practices. 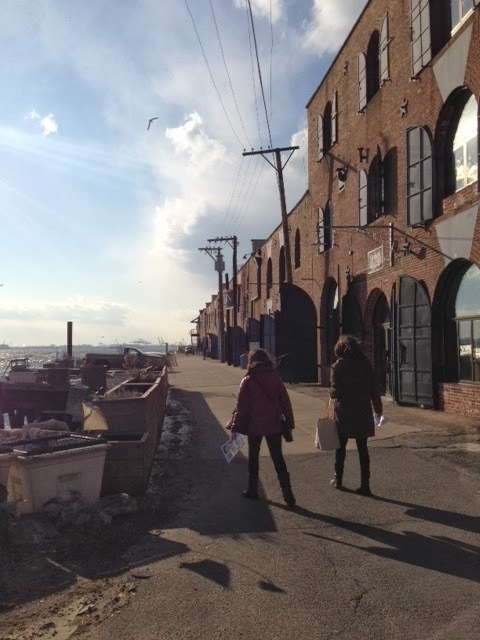 Our most recent trip was to Joe Coffee Roastery in Red Hook, Brooklyn. I personally had never been to a coffee roastery before, so I was excited to see the process in action. When we first arrived, we walked around the building and toured the facility. There were bags on top of more bags of coffee beans, waiting to be roasted, ground, and transformed into delicious Joe Coffee. We also saw the massive coffee bean roaster they use for roasting their product. 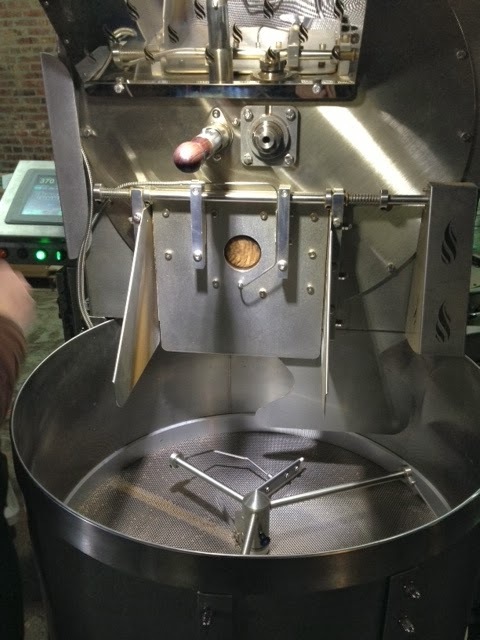 The roasting only takes approximately nine minutes from start to finish, but it is very tedious to make sure all the beans are roasted evenly and at the correct temperature. The guy in charge of roasting the beans smells the product almost every 30 seconds to ensure the coffee roasts accurately. We watched them make a batch, and the smell was nothing short of amazing. Once we saw this, we were given the opportunity to roast our own personal batch in a smaller roaster. We then took the beans, ground them up and sipped on a fresh hot cup of Joe from our own batch. It was one of the best cups of coffee I’ve ever tasted. After we learned about roasting coffee beans, we did a tasting of the different beans they source to make Joe Coffee. 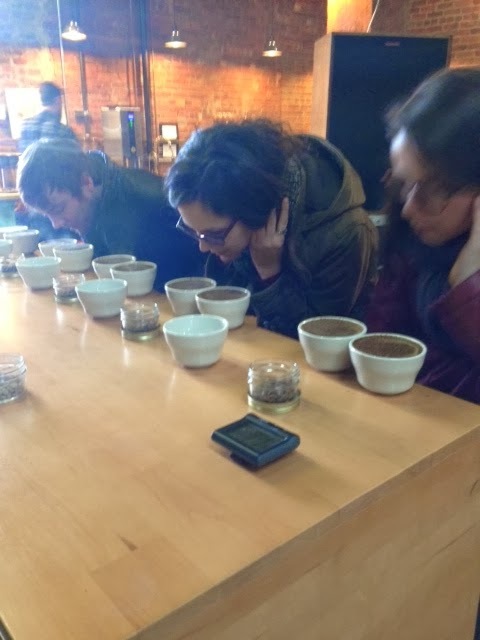 The process of tasting coffee is called “cupping,” and it involves smelling the steeping coffee, then slurping the coffee from a spoon about three times. The louder and more aggressive you slurp, the more accurate tasting you achieve. It’s not an attractive process, but it’s what works best when tasting coffee. It was so interesting trying the different beans, comparing them and analyzing their specific taste. We were also feeling pretty great and energized by the time we finished! The tour of Joe Coffee Roastery was an incredible experience. Learning how a green coffee bean from Columbia turns into a piping hot cup of joe was beyond interesting. I’m so glad we got to travel to the roastery as a class, and I’m looking forward to the field trips to come. 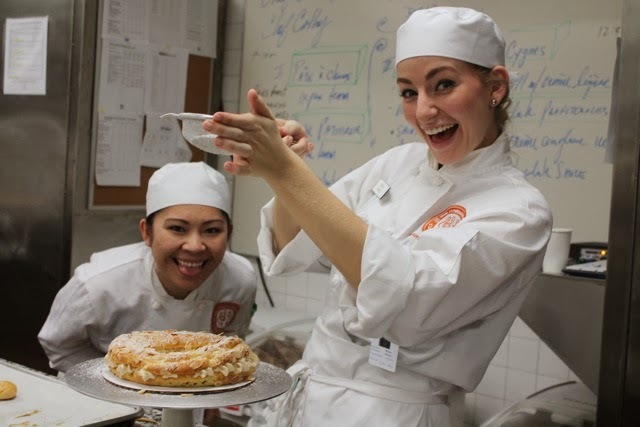 I didn't know anybody in NYC before making this leap towards my dream of becoming a professional pastry chef. Naturally, I was a bit nervous making the move from Toronto, but was excited more than anything. My first week or so was a bit lonely, and initially making friends was a slow process. Although everyone in my class was extremely friendly, spending time together outside of class was not really mentioned. However, after a couple weeks we all got more comfortable together and made plans outside of the kitchen. 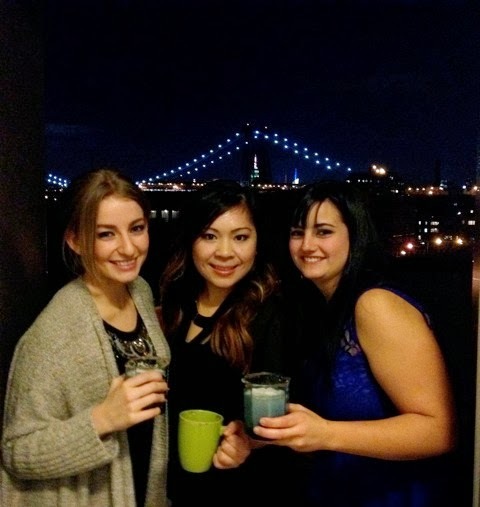 Now, I have made some close friends whom I can see having long lasting friendships with. My advice to international students coming to ICC is put yourself out there and remember that you are your classmates share the same passion and interests. If there is an ideal place to make friends and make connections with people, it's here! Also, many people in your class are in the same boat as you are. They are in a new place surrounded by new faces. New York City can be an intimidating place, but it is also the most amazing city in the world. Enjoying this incredible place is far more fun with friends that it is on your own. The International Culinary Center's webinar series continues with wisdom from Chef Cesare Casella, our Dean of Italian Studies. In this exclusive webinar, Chef Cesare Casella explains how he became a respected restaurateur, educator, and master of Italian cuisine. Chef Casella traces his story through his family restaurant in Italy where he earned a Michelin star, his arrival in New York in the early 1990s, launching his own restaurants, and his work as Dean of Italian Studies at the International Culinary Center. PLUS: Want to follow in Chef Cesella’s footsteps and turn your passion for Italian cooking into a career? Enroll in the International Culinary Center’s Italian Culinary Experience today in New York or California. 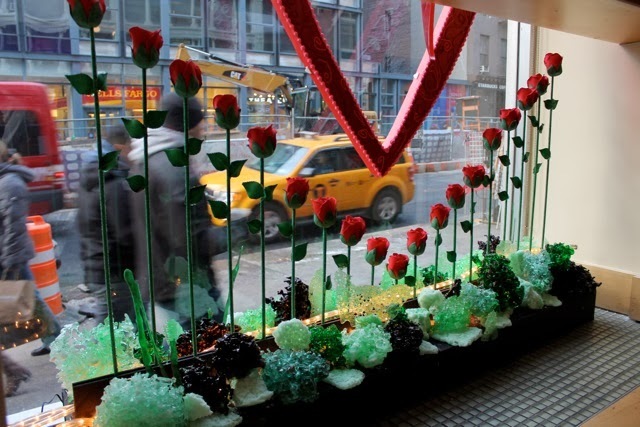 In case any of you havn't already seen the gorgeous Valentine’s Day Showpiece featured in the front window of L'Ecole you definitely have to check it out. Last week, I had the amazing opportunity to volunteer in the production and assembly of the sugar display. I was so excited to volunteer for this, as I was very disappointed that my class started too late to help out with the jaw dropping gingerbread house showpiece around Christmas time. On my first day of volunteering, I'll admit I was completely intimidated. The chefs and students were complete professionals; their work was so beautiful. Seeing as I have yet to reach the sugar and pastillage units in my class, I was all the more amazed. The way the chefs showed me how everything was made completely blew me away. A couple of my fellow classmates and I started out by making sugar paste. Many of the ingredients we could not even pronounce, much less know what purpose they served in the recipe. However, with the helpful guidance of the chefs we completed the sugar paste and it turned out great. In the following days we hand shaped decorations, glued them, and finally put the final piece together in the front window. The showpiece is made almost entirely of sugar. Sugar roses, hearts, swirls and grass - simply incredible! As beautiful as it was, it was a challenge hanging it in the window because everything was so delicate. In the end, we got it done and I am so proud that I was able to help out in creating this piece of art. If you are near Broadway and Grand Street in Soho, N.Y., make sure you stop by to admire our hard work. And don't forget to take a picture with your Valentine! 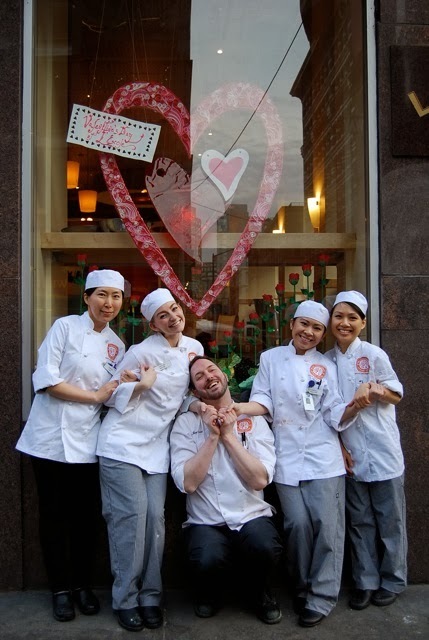 Share your pic with @ICCedu on Twitter or Instagram with #ICCValentine. Early last Saturday morning, ICC's third Farm-to-Table class met at Grand Central Station, boarded the Metro North train and headed out of the city. The final destination: Blue Hill at Stone Barns and Stone Barns Center for Food and Agriculture. As a part of the Culinary Arts plus Farm-to-Table program at ICC, the education concludes with a week-long culinary experience at the farm, learning from the land and cooking with the Blue Hill kitchen team. The students were beyond excited to get their first taste of the farm, and the field trip was nothing short of amazing. When the students arrived, they were greeted with a warm welcome from Irene Hamburger and Jennifer Rothman, and were quickly whisked away to take a tour of Stone Barns Center's farm. They were surprised to see a greenhouse stocked full of produce in the dead of winter. The farmers gave the students the opportunity to pull “survivor spinach” right out of the ground and to taste it. All reports said it was delicious, surprisingly sweet! After the tour the students had lunch at the Blue Hill Café and a meet-and-greet with Blue Hill chefs and Stone Barns Center farmers. The day concluded with a charcuterie lesson from Blue Hill Vice President of Culinary Affairs, Chef Adam Kaye. The class was being held in preparation of the restaurant's annual sausage and beer. As Adam described the different cuts of pork, he also provided tastes — ham and speck, just to name a few. The class had a great experience, and are now more excited than ever to spend a week developing their cooking skills at Blue Hill this June.